LSE’s PR machine has been in firing away, shamefully attempting to whitewash the closure of The Women’s Library and present themselves as it’s saviours. When in fact, they have simply taken the valuable collections and integrated them into their academic corporate library in central London. This means an end to community and outreach work and the closure of the purpose-built reading room and gallery. At least now emminent professors won’t have to dirty their shoes with a trip to Tower Hamlets! We re-print below the press release of the campaign, which vows to keep the building open. 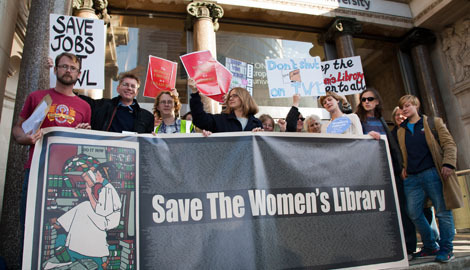 Women’s Library supporters have vowed to continue their campaign, following an announcement by LSE and London Metropolitan University that The Women’s Library will leave its purpose-built home in the East End of London. The decision to close the building follows a series of protests by the Save The Women’s Library Campaign and the presentation of a 12,000-strong petition against the Library’s closure. The Library’s current home opened just ten years ago, with £4.2m funding from the Heritage Lottery Fund and contributions from other supporters. It encompasses purpose-designed collections storage, education and exhibition space, and light and airy reading room facilities. A rare monument to women’s lives, learning and scholarship designed by a woman architect (Claire Wright MBE), it was purpose-built on the site of an old Wash House off Petticoat Lane to provide safe housing for its unique collections, open up access to the public, and contribute to the regeneration of Tower Hamlets. Its high quality, sustainable design, and contribution to the local environment was recognised with an award from the Royal Institute of British Architects. In 2002 it was named RIBA Journal’s building of the year, the Brick Award’s Best UK Public Building, and winner of the Liveable City Sustainability Award. A dedicated, high-quality building for The Women’s Library’s collections recognises the importance of the fight for women’s equality to national life.